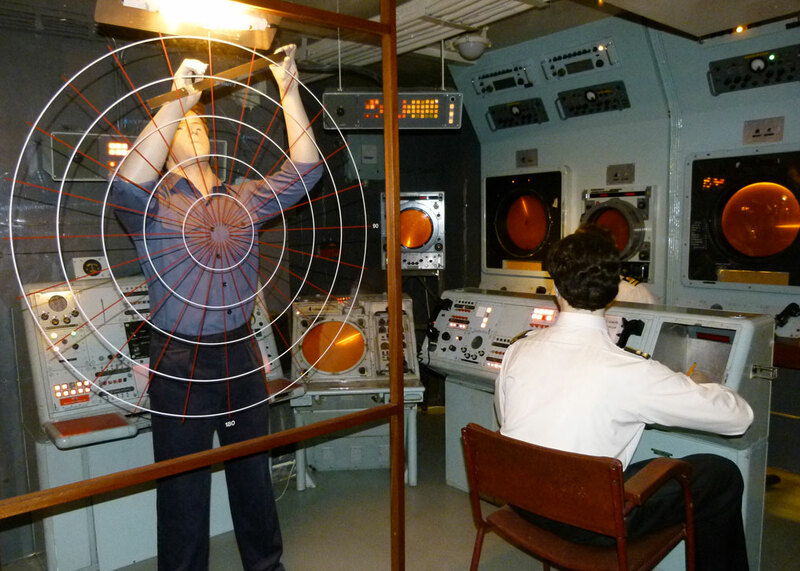 The Royal Navy’s Fleet Air Arm Museum is situated, with startling logic, twenty miles or more from the sea. It is a massive place and, if you haven’t already guessed, it tells the story of the Royal Navy in the air: oh, come on – you know what I mean… The museum opened in 1964 and is actually on an operational Fleet Air Arm base, Royal Naval Air Station, Yeovilton, Somerset, also known as HMS Heron. Underneath – Light blue delta-wing aircraft – BAC 221 (1954). Produced as part of the Concorde development programme, this aircraft set a new world airspeed record of 1,132 mph on 10th March 1956. Middle – Hawker Hunter T8M – a two-seat trainer from 1958. Foreground with folded wings – Westland Wyvern TF1 – a single-seat carrier-based multi-role strike aircraft dating from 1947. This particular aircraft never flew. The British Admiralty was looking into the usefulness of aircraft as early as 1903. In 1909, it appointed the firm of Vickers to design and build an airship. In 1912, the first aircraft took off from a British warship, HMS Africa (the US Navy achieved this in 1910) and, later that year, the Royal Flying Corps, the air arm of the British fighting services, was founded with military and naval wings (pun intended). In 1914, the Royal Naval Air Service was formed, under the direct control of the Admiralty, with the RFC continuing as the flying branch of the Army. In 1918, the RNAS and RFC were merged to create a separate Royal Air Force and, in 1924, the Fleet Air Arm was created within this. In 1939, control of the Fleet Air Arm passed completely to the Admiralty, where it remains to this day. 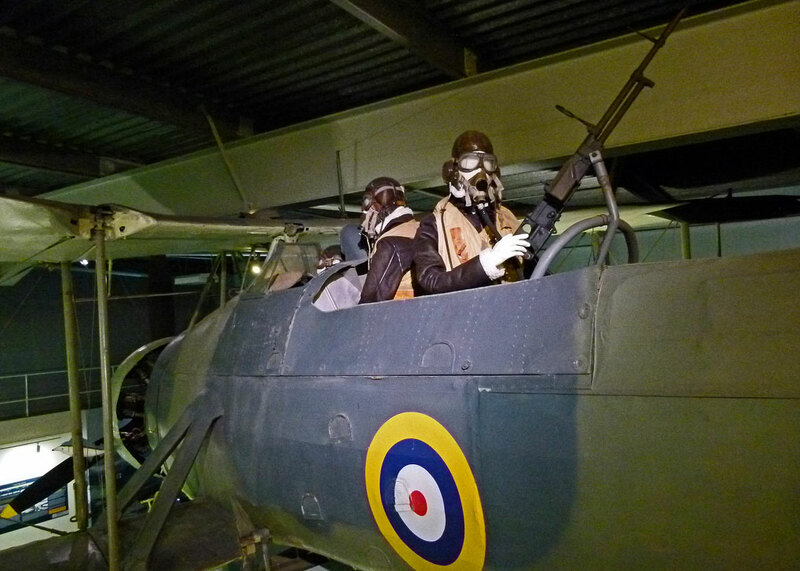 The Fleet Air Arm Museum has more than 100 ‘airframes’ in its collection, dating from 1909 to modern times, and it displays the best, as well as other items and artefacts, in four large halls and a dozen or more particular exhibitions. These range from the very early days of powered flight and the First World War, battling Zeppelin airships, through the Second World War, including the Battle of the Atlantic, the Korean War (1950-53) and the Falklands War of 1982, right up to the Gulf Wars, Bosnia and Afghanistan. So the Fleet Air Arm has a reasonably long, and certainly proud, history. It is also natural to associate this with aircraft carriers, which of course enable a state to operate fixed-wing aircraft far from home, without relying on land bases. The first aircraft carriers were adapted from ships built for other purposes. The first purpose-designed aircraft carrier in the world was the Royal Navy’s HMS Hermes – though design changes and other delays meant that this was not commissioned until 1924: so, the quiz books will rightly tell you that first aircraft carrier in the world was the Hōshō, launched for the Imperial Japanese Navy in 1922. McDonnell Phantom FG1 two-seat interceptor fighter – this aircraft was built at St Louis Missouri, USA, and first flew in 1966. It was used for trials in the UK from 1969 until arriving at the museum in 1988. The de Havilland Sea Vampire Mk 1 – one of the museum’s unique aircraft, this is the actual aircraft that in December 1945 was the first jet aeroplane in the world to land on an aircraft carrier. One of the highlights of the museum is the award-winning Carrier exhibition. This astonishingly ambitious display recreates a section of an aircraft carrier’s flight-deck as well as the ‘island’ – the bridge, where visitors can walk through departments going about their duties operating aircraft at sea, staffed by Royal Navy mannequins. Our own experience would have been more fascinating without the anti-social antics of a few obnoxious teenage schoolboys, too immature to be allowed out, really, whose inadequate teachers seemed unable, or unwilling, to control. I am not a violent man; but it was a close thing… They could not spoil the flight deck, however, which seemed vast and is intended to represent the flight deck of the renowned carrier, HMS Ark Royal. You are ‘transported’ there by a mock-up helicopter. With about ten aircraft and a background of sound-effects and projectors, it succeeds in being simultaneously interesting and dramatic as well as, to be honest, a little scary; tremendous! The Fleet Air Arm Museum says that, “The aircraft carrier experience was created with the intention of showing naval aircraft in their natural home, the aircraft carrier.” Hmm. Given that statement, the history of Royal Navy aircraft carriers, and assuming that these highly expensive bits of kit are still considered necessary in our ever-shrinking world, it is kind of surprising that Her Majesty’s Government decided the Royal Navy could rub along without one for a decade or so. The last fixed-wing aircraft to take off from a British carrier did so in November 2010 and the ship, HMS Ark Royal, was decommissioned in March 2011. Two new carriers, HMS Queen Elizabeth and HMS Prince of Wales, are due to be operational by 2020. It takes between 5 and 9 years to build an aircraft carrier. Is it not comforting that we pay for minds so bright they accurately predicted that aircraft carriers would become surplus to requirements in 2011, but that changing circumstances would mean they will be needed again by 2020? Only a cynic would suggest that this is either a colossal bungle in defence planning, if carriers are needed, or a colossal waste of money if they’re not. Meanwhile, the only aircraft the Fleet Air Arm can operate at sea are helicopters. Concorde 002’s cockpit. Grainy isn’t it? Among the twenty one unique aircraft in the museum’s possession is Concorde 002, the first British prototype of this fabulous airliner, worthy of the word ‘iconic’. 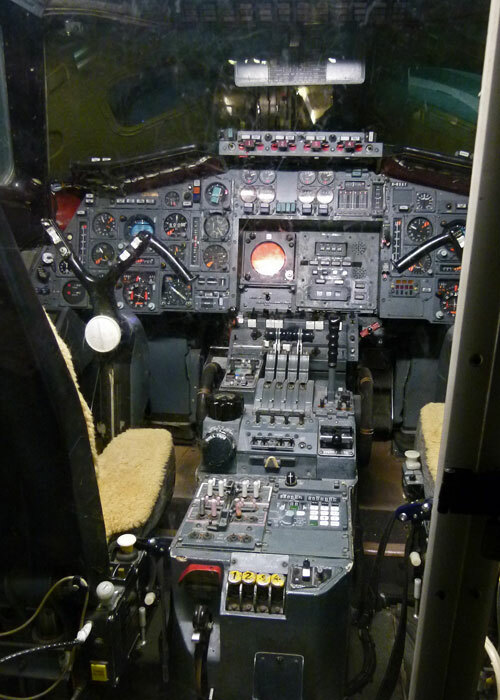 Not without reason – and I certainly can’t tell you – few people are aware of Concorde’s close association with the Fleet Air Arm – but who cares? Only 20 Concordes, a joint venture between Britain and France which began in 1962, were ever built. Concorde 002 first flew in 1969 and last flew in 1976. 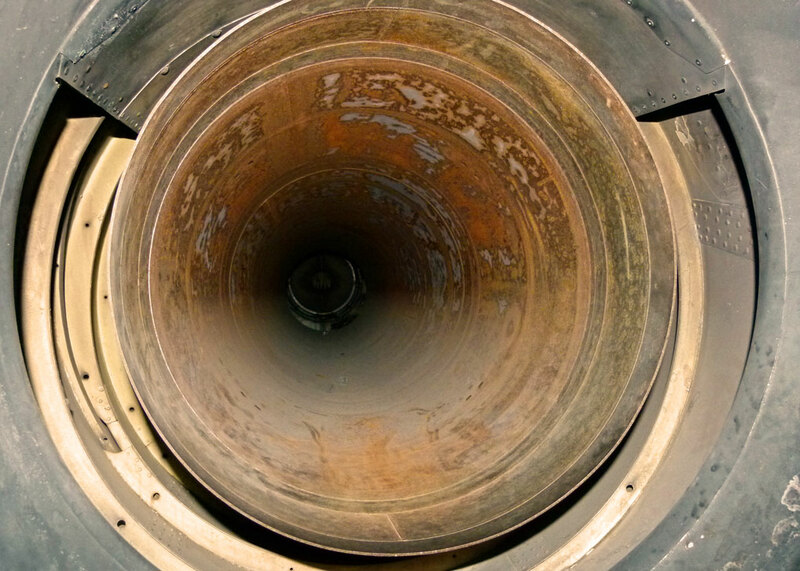 It achieved a maximum speed of Mach 2.05, roughly 1,350 mph. Outside, it is so graceful; inside it is unexpectedly, but unsurprisingly, small – and basic. I assume the passenger versions were rather better fitted out, but imagine it would still be buttock-rubbingly cosy in the cabin. The first commercial flight of Concorde took place on 21st January 1976 when Concordes operated by British Airways and Air France flew from London Heathrow to Bahrain and Paris-Charles de Gaulle to Rio de Janeiro. The first flight to the USA was on 24th May 1976 to Washington: it took 3½ hours; today’s normal non-stop flight time, in a Boeing 747 for example, is 7–8 hours. The fastest transatlantic Concorde crossing was 2 hours 52 minutes on 7th February 1996 from New York to London. The last commercial flight was in 2003. I met a Concorde pilot once; he had a collection of little plastic aeroplanes in his office. British Aerospace Sea Harrier on the runway at RNAS Yeovilton, snapped through a window. 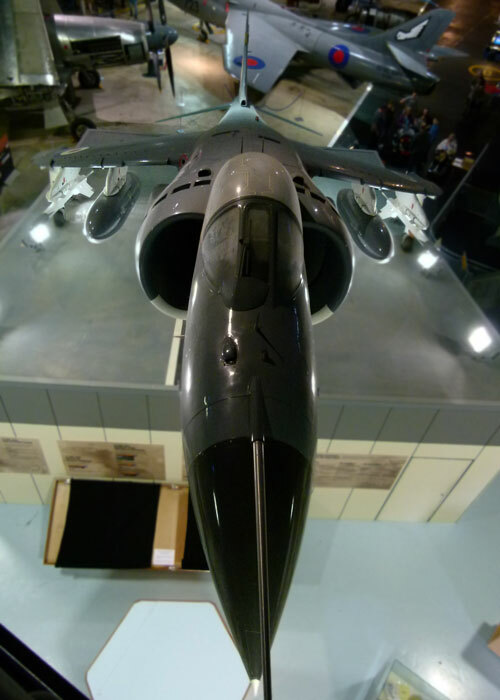 The Falklands exhibition includes part of an Israeli-manufactured Argentinean aircraft that had been shot down and a quantity of kit captured from Argentinean troops, some of which were as young as 15 or 16. 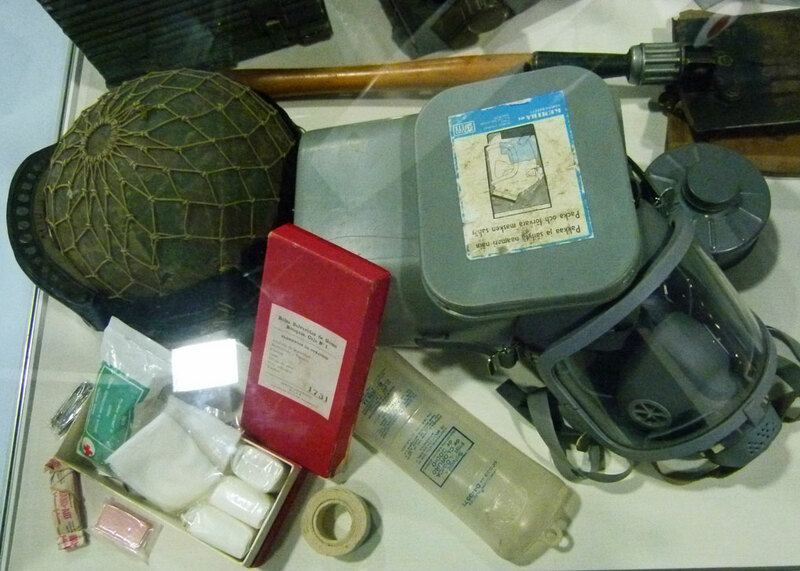 This case includes cooking equipment, rations, a radio, gas mask and a tin helmet – probably ex-US forces. Sopwith Pup replica, built in 1983. The Pup was a single-seater fighter that came into service in 1916 but was outclassed by the end of 1917. It was great for landing and taking off from aircraft carriers, apparently. 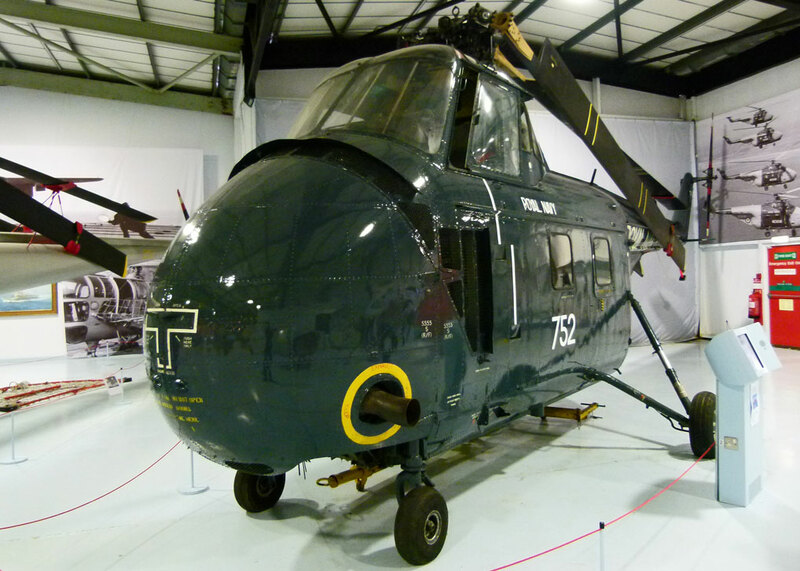 Westland Whirlwind HAS7 helicopter, built at Yeovil in 1957 – one of many helicopters on display, including an exhibition highlighting the Royal Navy’s search and rescue role. Grumman Martlet AL246 – an American fighter, one of a batch originally ordered by the French Navy but diverted to Britain after the fall of France in 1940. This particular aircraft spent most of its operational life in Scotland. A pair of operational Merlin helicopters, snapped on the runway at RNAS Yeovilton. Fairey Swordfish II – the last biplane in the world to see active service, it first flew in 1934 and was still in service in 1945. Known as ‘the Stringbag’, it had a crew of 3 and a top speed of 139 mph. 21 Swordfish aircraft flying from HMS Illustrious changed the balance of naval power in the Mediterranean in November 1940 in an attack on the Italian fleet at Taranto and, in 1941, Swordfish successfully torpedoed the German battleship Bismarck. The particular aircraft on display served in the Atlantic Convoys. Distinctive gull-winged Corsair KD 431, built at Akron, Ohio by Goodyear Aircraft Co. A single-seater fighter-bomber, this aircraft was delivered to the UK in 1944 and was only in service for about a year. 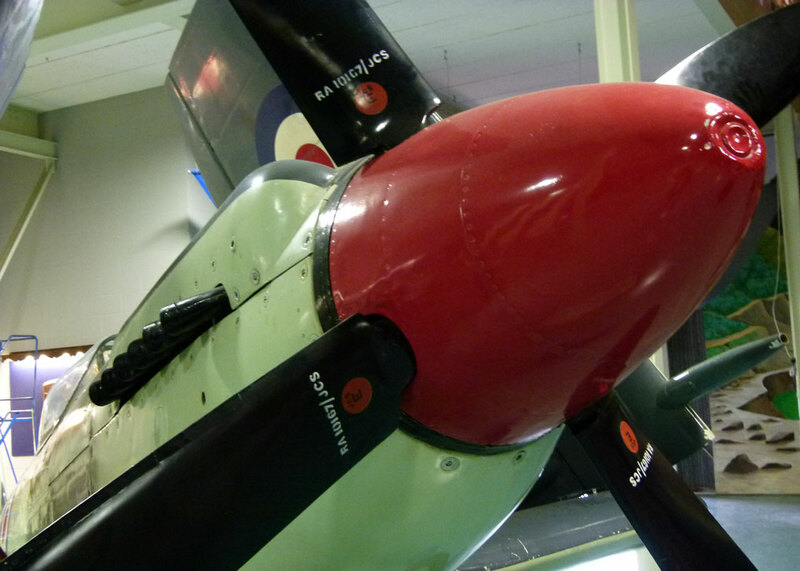 The nose of a Supermarine Seafire F17, the navy version of the famous Spitfire fighter. 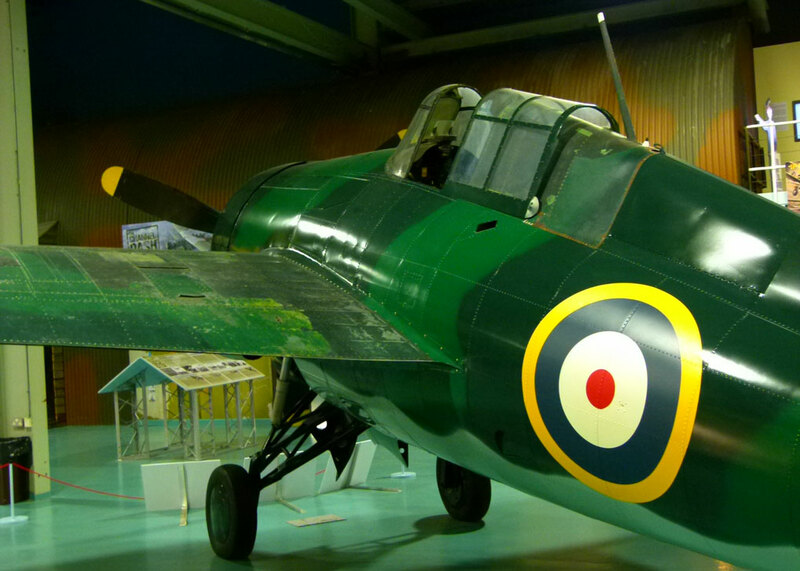 This particular aircraft was built at Yeovil by Westland Aircraft and served from 1945 – 1954. So interesting. My dad was in the Fleet Air Arm and kept a very keen interest to the end, I still have his mementoes. He flew in the “Stringbag”. Thanks, David; you’d probably enjoy this place. I’d love to hear more about your dad! I definitely will go there and when I’ve sorted through some papers of his that I have just unearthed , I’ll get back to you! You remind me that I must pay a visit to our aviation museum. They’re Merlins, not Sea Kings! Thank you – happy to be corrected! I enjoyed this very much – I like to read anything that involves the Royal Navy. It was the Royal Navy that did much to establish England as a great world power. Fascinating post this looks like a really interesting place to visit. My husband’s a pilot, but this is a perfect post for him. 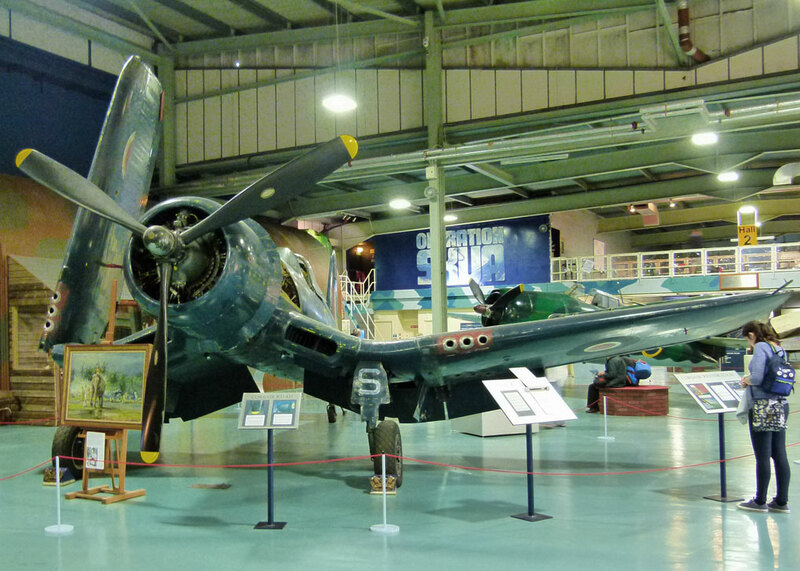 We’ve seen a lot of aviation museums in the U.S., but there’s always room for one more, and that it happens to be in GB, makes it even more exciting. 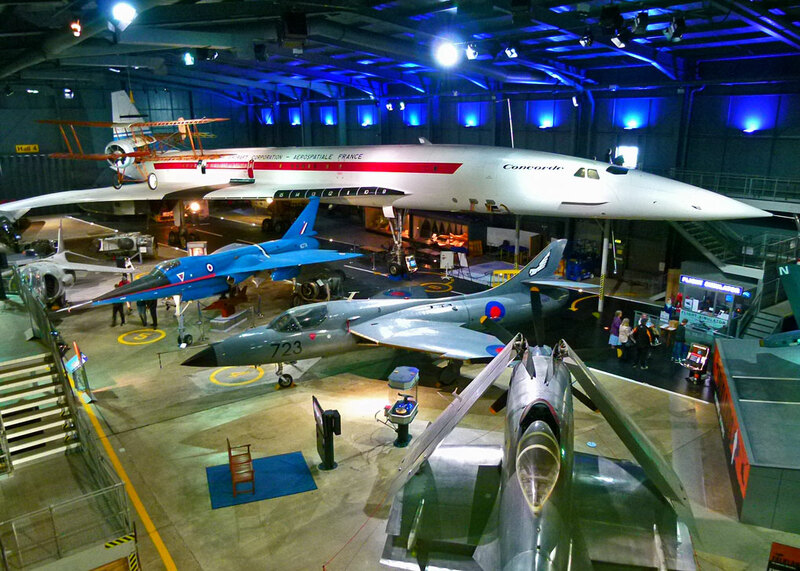 For anyone interested in aviation, that looks like a fabulous museum to visit! My boys would be here for hours and hours. They would also jump at visiting the tank museum. I enjoyed your quote “pay the minds to tell us when we will need the carriers again.” 😉 Yep, over here too. Thank you for the post, well done. As ex RAF my husband had a trip down memory lane, as was I, WRAF, but never served where there were aircraft. We visited here a couple of times with my parents living in Wincanton. More good memories. Thanks. Mrs. C. Told me about this post. I could spend a day or two there! Very interesting and well done. I’m so glad it reminded you of your father. I hope you do get to visit – it will mean more to you than to those of us without the direct connection. Very interesting post! The museum looks so well laid out – I’m sure I’d enjoy a visit here. I wasn’t expecting to enjoy this bit of history but I did! Very much. I love the way the aircraft are displayed and you, of course, pick out the most interesting bits to educate us. Impressive to see all that technology in one place – but I still prefer the railroad museum in York. What a fantastic looking museum. 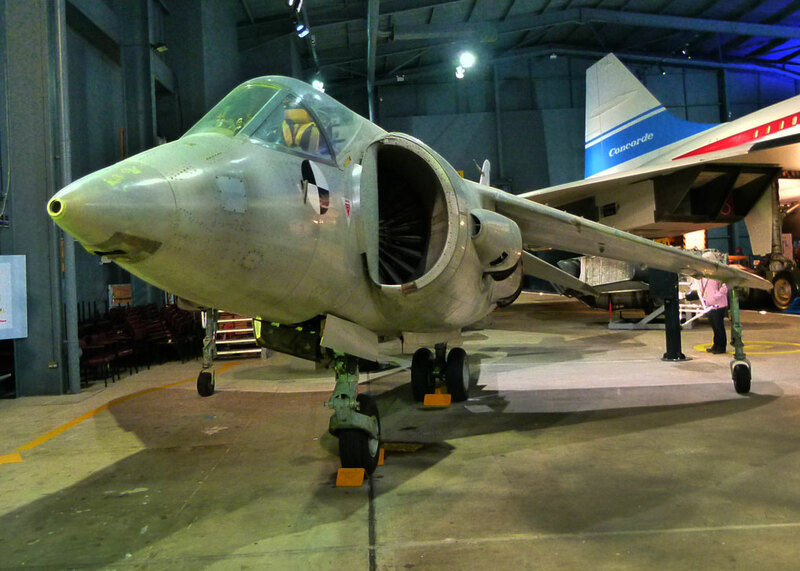 We’ve visited the aeronautic museum in DC and loved it, would probably love this one too. I am sure that Mr.C would find this post absolutely fascinating, even looking down an exhaust pipe. I will pass it along to him. I’ll admit that I found the IWM incredibly interesting and might even find this equally so if I saw it in person. IWM London is amazing – less sure about the one in Manchester. Love the harrier, what a crime we sold them off. 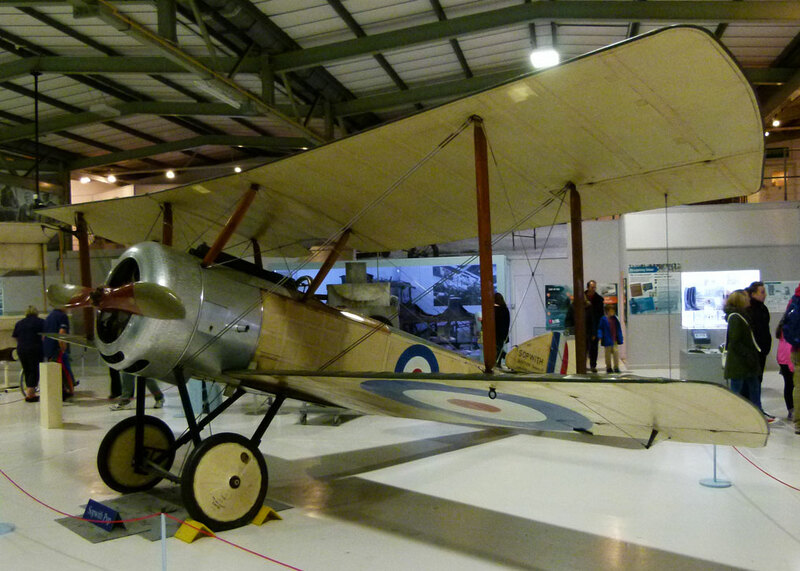 ALso the Sopwith, great little plane!